Berries, Fruits, Nuts & Shade For The Texas Gulf Coast! All of our offerings are container grown in three, five, and 10 gallon pots. Average size is between three and six feet tall. Berries and grapes are sturdy vigorous stock. Many are grafted varieties on rootstock developed for Houston's hot and humid climate. 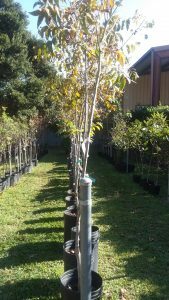 We are proud to stock trees from Brazos Citrus and R&T Nurseries, two trusted Texas growers. Keep watered until the time of planting. Choose the site. Avoid wet spaces, shady areas, or areas that do not receive at least 4-6 hours of direct sunlight each day. Spade the soil, and dig a large and wide bowl, NEVER a deep hole, at least twice the width of the pot. Ensure that after planting, the new tree's soil level is at the same level it stood in the pot. Back-fill the soil with equal parts of the existing earth and compost or prepared garden soil. Once filled, firm down lightly, add MULCH to keep roots from drying out, and water thoroughly with a mixture that includes ROOT STIMULATOR. Pruning will be essential most some fruit varieties, though not necessarily at the time of planting. Check the soil daily for moisture as the limited roots make the tree susceptible to dry weather damage. Keep soil evenly moist but never too wet as roots will rot. Use only liquid root stimulator at least monthly throughout the first year's growing season. Warning: synthetic granulated fertilizer will tend to burn new developing roots!